On Saturday May 27th Triple Six kicks off with the European Premiere of Quarries – Nils Taylor's backwoods horror where a group of women on a wilderness expedition are stalked . A taut and intense feature that will start Triple Six at one hell of a pace. The Unkindness of Ravens is director Lawrie Brewster's third feature and follows from his stunning Lord of Tears (2013). Ravens follows the story of a homeless veteran who battles his demons in the Scottish Highlands. Visually stunning Brewster shows his vision and direction grows with each film and this is a must on the BIG SCREEN. Offensive is the latest offering from director Jon Ford (The Dead) . Set in rural France Offensive follows a retired American couple who inherit a house on the proviso they live there for a year first. In what seems a perfect and idyllic setting they soon find out the local youths might not be all they seem! Showing in it's full uncut version (maybe for the last time) this is a wild ride. Previously only screened at Frightfest 2016 this is a must see! Cruel Summer is not a new release , in fact it is out on UK DVD. However the Triple Six directors felt that Phil Escott and Craig Newman's feature was something that NEEDED to be seen on the big screen. Starring Emmerdale's Danny Miller, Cruel Summer shows how one decision can change lives and is a truly haunting tale based in a single day and you will not be able to shift this from deep in your soul! And to close Triple Six is the English Premiere of Ben Young's stunning debut Hounds of Love . One of the most important genre releases this decade Hounds of Love is a masterclass in suspense. A young woman is randomly abducted from a suburban street by a disturbed couple. As she observes the dynamic between her captors she quickly realises she must drive a wedge between them if she is to survive.You will feel almost every emotion in the 110 minute run time and with acting performances to drool over then what a way to finish. 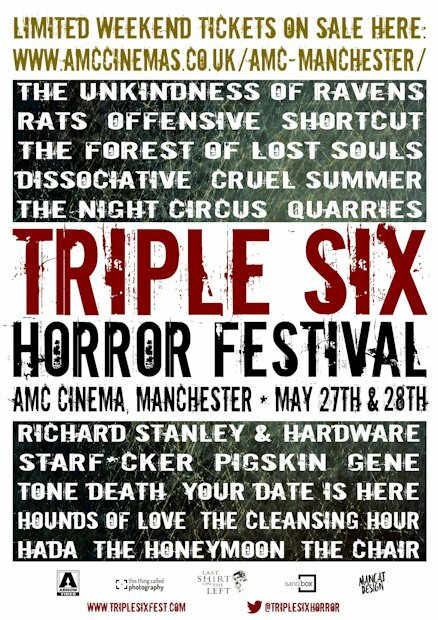 Triple Six are also very happy to welcome Richard Stanley as our special guest for the entire weekend which will include an amazing live Q&A following the very rare 35mm screening of his seminal directorial debut Hardware (1990) . This will be something very special indeed and the Q&A will not only focus on Hardware but also Richard's colourful and at times unbelievable career in cinema. Visit the festival's Facebook and Twitter pages.